Google today released Street View, allowing users to zoom in to street level in New York, Miami, San Francisco, Denver and Las Vegas. (I can’t help but think Denver was selected to get a dig in at Mapquest.) It’s the greatest thing since… the original Google Maps. Street View allows you to virtually walk along a given street. Amazon’s A9 tried this a couple of years ago, but Google’s attempt is much easier to navigate. A9 rendered sequential pictures of a given block; I always got lost trying to use A9. Google presents the imagery as a Flash that you can “walk” through. You can turn your head or zoom in and out. You can even turn down a corner onto another street. 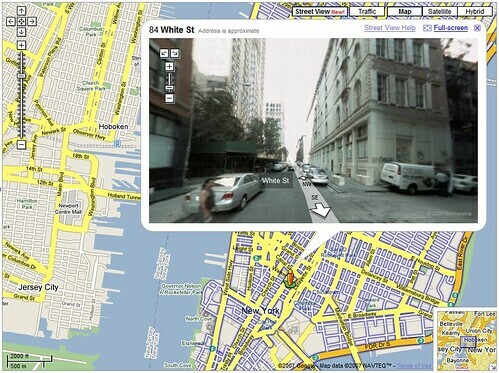 Street View supports keyboard shortcuts; the left and right arrow pan the view and up/down move you forward and back. The imagery makes it easy to get a feel for the neighborhood. (Minus the smell of trash and honking of cars.) It’s sufficiently blurry that you can’t make out faces or read license plates. It’s like walking around the city without your glasses. It’s not yet integrated with the map search. For example, I did a search for “Hummus” and found the business. But I then had to move my little avatar to the business location. Instant teleportation would be nice; I should be dropped in front of the business facing it. At least you don’t have to wait to hail a cab. Update: Although I couldn’t make out license plates or faces in New York, I was able to see them in the Bay Area. Google did its own imaging in the Bay Area and those images seem to be much clearer. This entry was posted in google, local search, maps, street view. Bookmark the permalink. I don’t know what all the hub-ub is about privacy-wise. You don’t have any when you’re in PUBLIC! Duh. when opening iin Internet Explorer, it has some overlapping.